Foresters, landowners, managers, community and conservation groups, land trustees, scientists and policymakers will meet Sept. 13 to 15 in Eureka for the 2016 Coast Redwood Science Symposium. The symposium, which first convened in Humboldt County in 1996, will feature 70 speakers, 25 poster presentations and three field trips to explore the redwood forests of the North Coast. 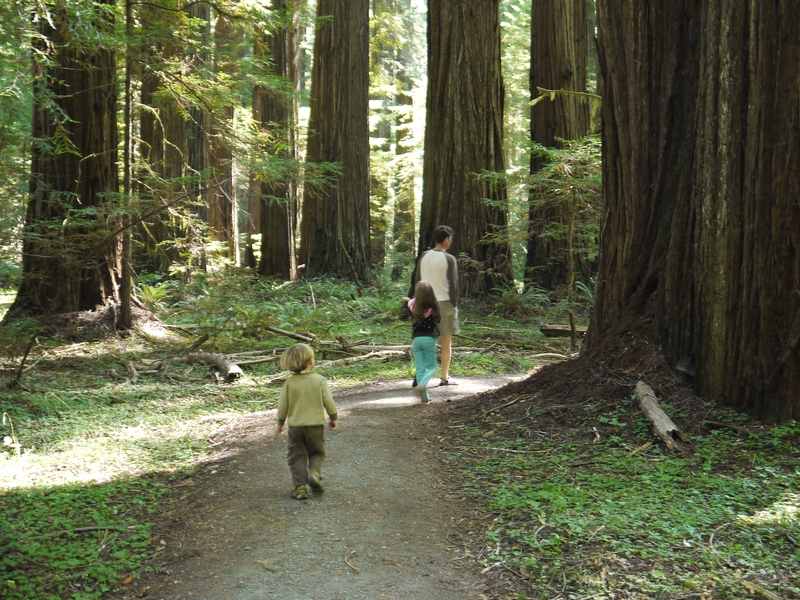 From Brookings, Ore., to Big Sur, redwoods grow in a variety of habitats and conditions. On the field trips, participants will get to see both conservation and industrial aspects of old growth and timber forests. One tour will visit the City of Arcata Community Forest. Community members use the actively managed forest on a daily basis. A lot can be learned from both private and public land-management strategies and it is critical that the policies and strategies guiding use and management within the redwood region be reviewed and updated based on objective, scientific information, said Valachovic. In the wake of several catastrophic wildfires this summer, it has been widely publicized that drought, disease and insects have killed more than 66 million trees in California. 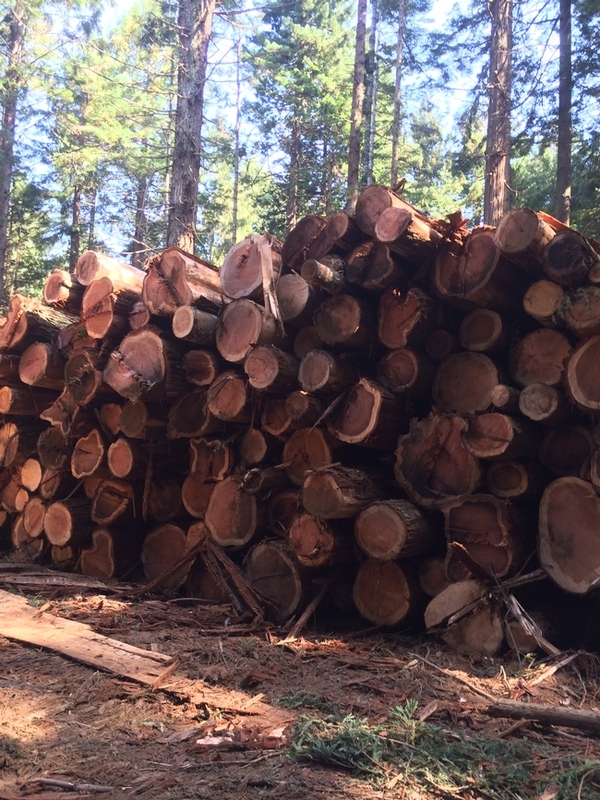 One place to dispose of dead trees is biomass power plants, which burn low-value forest materials to generate energy for homes and businesses. At the symposium, participants will discuss the impact of recent closures of bioenergy or biomass power plants. 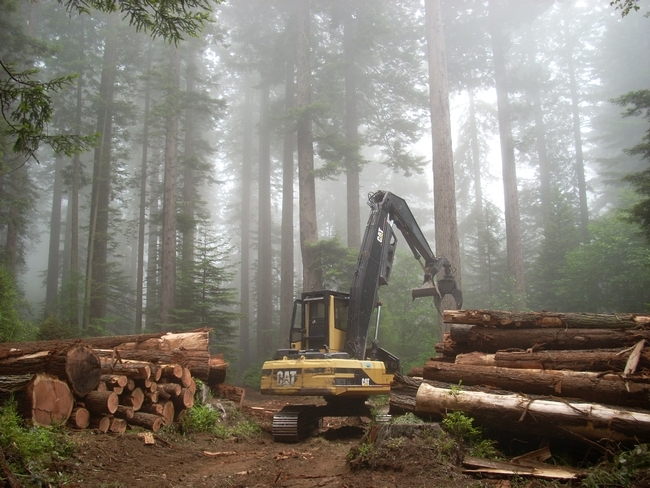 When Californians buy redwood building products, the money circulates locally and provides an economic incentive to steward and conserve local forests, says Valachovic. North Tour. Redwood National and State Parks and Green Diamond Resource Company will highlight redwood thinning practices. The tour will travel north to the Orick area of Redwood National and State Parks to look at restoration forestry practices designed to enhance structural diversity of younger even-aged forests. The afternoon will be spent walking in the Korbel area, viewing Green Diamond's commercial thinning of third-growth forests and wildlife management strategies in managed landscapes. Redwood is widely known for its durability and decay resistance. Humboldt Bay Tour. 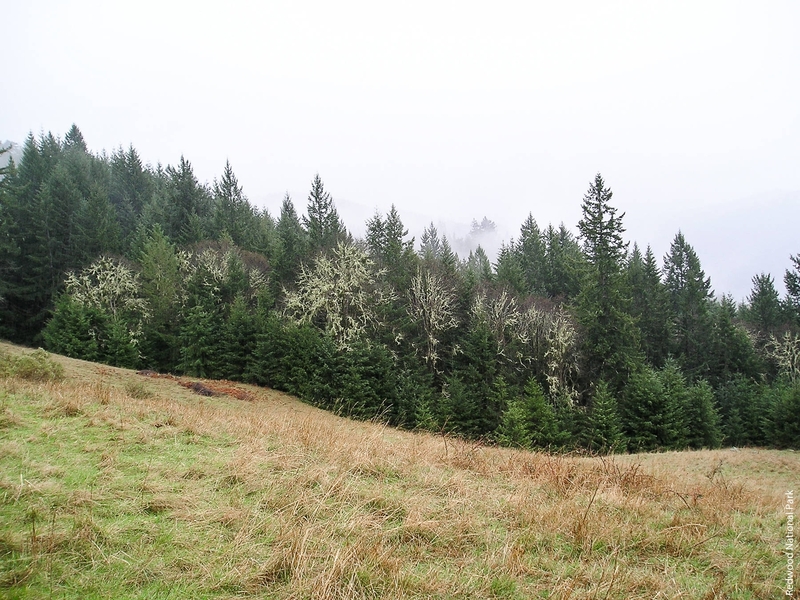 The City of Arcata, the County of Humboldt, and several private landowners will show participants modern conservation and community forestry efforts. The tour will visit the City of Arcata Community Forest — the oldest community forest in California — where there is active forest management and community members use an extensive trail system through managed stands on a daily basis. The tour will also visit the newly established McKay Community Forest near Eureka and several private properties that practice innovative land management. This tour will showcase uneven-aged redwood silviculture, funding for conservation activities and techniques to maintain social license within a community, and discuss the benefits and liabilities of managing bigger and older trees. South Tour. The tour with Humboldt Redwood Company looks into conservation planning on industrial timberland. In the historic lumber town of Scotia, participants will tour a mill and visit Humboldt Redwood Company's 40,000 gallon freshwater aquarium. In the afternoon, the tour will hear about active forest management and habitat conservation strategies for the protection of endangered species such as the marbled murrelet, northern spotted owl, and coho, chinook and steelhead salmon. The 2016 Coast Redwood Science Symposium, sponsored by UC Agriculture and Natural Resources, will be held at the Red Lion Inn in Eureka. For more information or to register, visit http://ucanr.edu/sites/Redwood2016. Encroaching conifers obscure a stand of oak in Redwood National Park. The California State Assembly passed a bill unanimously that would provide new resources to landowners to halt the encroachment of conifers on oak woodland, reported Hunter Cresswell in the Times-Standard. The bill (AB 1958) must be approved by the State Senate and Gov. Brown before it becomes law. Oak woodlands are "some of the most biodiverse ecosystems in the North West," said UC Cooperative Extension forest advisor Yana Valochovic. "They are preferentially used by a lot of different bird species." In the past, fires would burn out conifers and underbrush on oak woodland annually, but aggressive fire suppression is enabling them to spread unchecked, crowding out oaks. Yanachovic is finishing a three-year research project on conifer encroachment, and AB 1958, if passed, would put policies in place so people can get rid of the conifers without jumping through as many bureaucratic hoops as before, the article said. “It clarifies that the cutting of younger conifers out of oak woodlands does not qualify as conversion of timberlands,” she said. 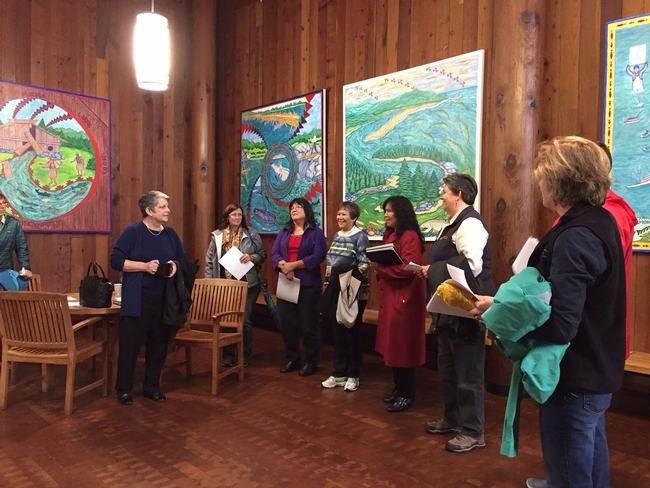 Janet Napolitano, who is on a two-day tour in Humboldt County, is the first UC president to visit the Northern California locale, reported Marc Vartabedian in the Eureka Times-Standard. Napolitano is joined by Glenda Humiston, vice president of UC Agriculture and Natural Resources. Napolitano and Humiston are visiting an Indian health services facility, a seafood company, a forest and a high school. UC has had a long presence in Humboldt County. Humboldt was the site of the first UC Cooperative Extension office in California, established in 1913. Janet Napolitano (left) and Glenda Humiston (with white sleeves) meet the staff at United Indian Health Services at Potawot Health Village. The facility serves 15,000 people in Humboldt and Del Norte counties. Humboldt County tanoak trees that have succumbed to sudden oak death. 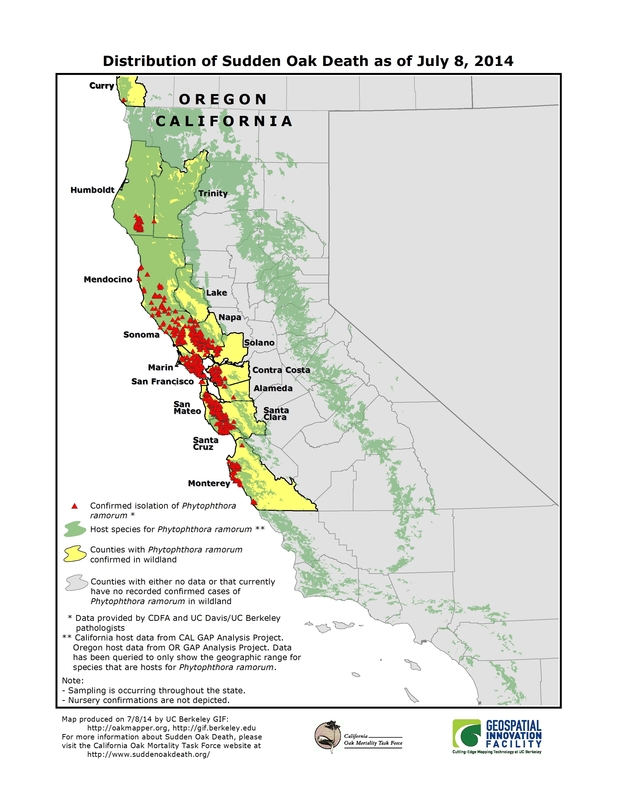 Thirteen years after sudden oak death was first detected in California, the disease's range in northern coastal areas of California and southwest Oregon continues to grow, according to a report by Michael Joyce on Jefferson Public Radio. Joyce interviewed Yana Valachovic, a forest advisor for UC Agriculture and Natural Resources in Humboldt and Del Norte counties. Valachovic is also director of the UC ANR Cooperative Extension offices in Humboldt and Del Norte. "For me, the challenge is communicating to the public the disease has not gone away; in fact, it's actually getting substantially worse," Valachovic said. 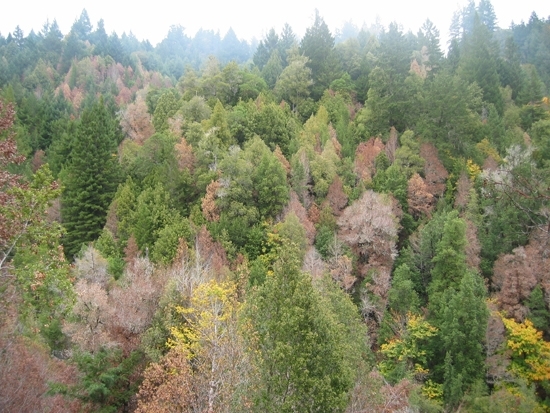 Sudden oak death is caused by the pathogen Phytophthora ramorum. Currently less than 2 percent of Humboldt County's 2.25 million acres of forest are impacted by sudden oak death. But the average annual rate of expansion per year is 3,500 acres, Valachovic said. One challenge related to containing the disease is the structure of California forest agencies. "The wildlands of California don't have a single agency that's responsible for controlling invasive introductions," she said. "Secondarily, there is no funding source that is set aside to manage these kind of epidemics. And so everything is piecemealed together: piecemealed responsibility, piecemealed in funding to address these issues." Furthermore, Forest Service funds can only be used for monitoring, containment and education. Joyce concluded the story with a question: "How will we learn more about this disease that is spreading through our forests at a clip of about 5 miles per year?" Read more about sudden oak death on the California Oak Mortality Task Force website. A foothill dwelling landscaped with a five-foot non-combustible zone. The building is also equipped with an extra large rain barrell that collects water during storms for irrigating plants. California law requires homeowners in wildfire-prone areas to create 100 feet of defensible space around their dwellings. UC Agriculture and Natural Resources (UC ANR) experts suggest going a bit farther by creating a five-foot buffer immediately surrounding the home completely devoid of plants and anything that can burn. 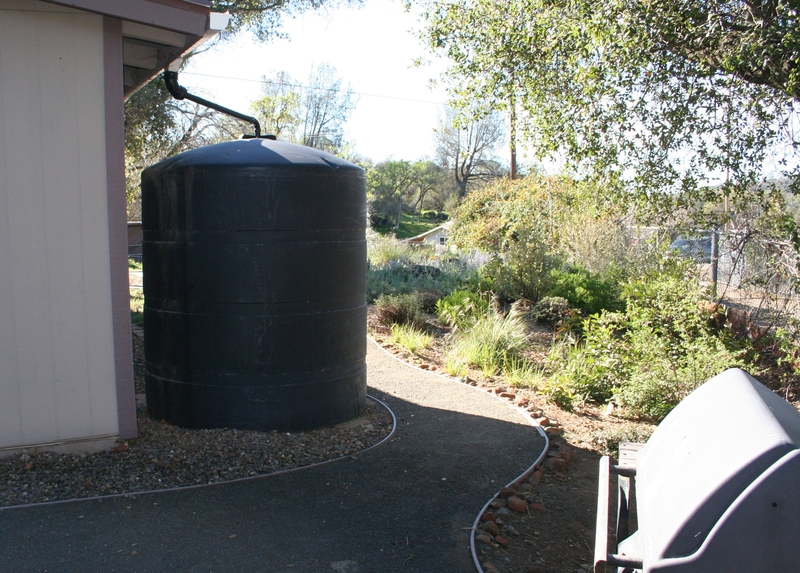 Few people think about creating the non-combustible zone, said UC ANR Cooperative Extension advisor Yana Valachovic, because they are so accustomed to foundation plantings. “Plants are used to anchor the house visually on the landscape. Without them, a house can look naked,” Valachovic said. In the five-foot non-combustible zone, even such common items as firewood, deck furniture, a wooden ladder, brooms and other wooden tools should be absent during the fire season. Rock mulch, decorative stone “hardscape,” and concrete paths can be aesthetically pleasing alternatives. “We have to simplify our landscapes and accept less vegetation to improve fire safety,” Valachovic said. UC Agriculture and Natural Resources is involved in fire research and education statewide, helping enhance understanding of fire's role in human communities and natural areas. A range of UC ANR publications and online tools address wildfire risk, fuels impacts of forest diseases and home wildfire mitigation. UC ANR is part of the California Fire Science Consortium, a network of fire science researchers, managers, and outreach specialists tasked with improving the availability and understanding of fire science and management knowledge. Valachovic, the UC ANR forestry advisor in Humboldt and Del Norte counties, recently hosted a webinar (recording available online) for homeowners in areas at wildfire risk, during which she said a five-foot non-combustible zone around the home increases the likelihood of home fire survival and provides several additional benefits to rural homeowners. Ten years ago, California extended the defensible space rule from 30 feet to 100. The area within 30 feet of the home should be maintained in a way authorities call “lean, green and clean.” Dry grass, leaves, brush and dead wood should be cleared. Open areas should be left between islands of vegetation in the 30-foot-zone to disrupt the path of a fire to the home. Trees within six feet of the house should be cut back or removed entirely. Beyond 30 feet, in the extended 100-foot reduced fuel zone, fire officials ask that landowners remove dead wood, debris and low tree branches. Small trees and plants growing under trees should be removed, as they act as ladders giving ground fires access to tree crowns. Valachovic said “fire resistant” plants can be characterized as having low growth, open structures, not holding on to dead leaves and having leaves with high moisture content. But she said no vegetation is truly fire safe.